Chia seeds (from the desert plant Salvia hispanica) have become quite mainstream in the health food world over the last couple of years. They have many touted health benefits, due to them being such nutrient dense little seeds. The nutrient profile of chia seeds can be found here. They are being researched as a potential treatment for type 2 diabetes. High in Omega 3 FA’s. Increase tooth and bone strength. Stating that something is high in a certain nutrient is easy enough to check on – see the nutrient profile linked above – but numbers 1, 4, 8, 9 and 10 need a little more in-depth research, which I hope to cover below. Just because something sounds plausible, doesn’t mean the evidence is there to back it up. Soluble fibre helps to slow the passage of food through the digestive system, allowing greater absorption of nutrients. Insoluble fibre provides bulk, absorbing water and easing the movement of food, including during defecation. The RDI of fibre is 30 g/day for adult men and 25 g/day for adult women. Chia seeds contain 34.4 g total dietary fibre in a 100 g sample, or 9.8 g/28 g (1 ounce). Chia seeds can absorb 10-12 times their weight when soaked in a liquid. Many people claim that chia seeds can aid in weight loss, as they expand in the stomach, thus increasing the feeling of satiety. However, there are limited studies on the medical benefits of chia seeds and none have described an increased rate of weight loss, however plausible the hypothesis is. The gelatinous outer layer that forms when chia seeds are exposed to liquid (they become “mucilaginous”) helps to bind the food together and slow its transport through the digestive tract, thus allowing more efficient absorption of nutrients and prevention of blood sugar spikes. More stable blood sugar levels will lead to less hunger pangs and more constant energy levels, thus less sugar/food cravings – this lends plausibility to the Type II Diabetes treatment theory but it isn’t going to mean that a Type II diabetic can eat a dose of sugar along with some chia seeds and get away with it. As the mucilaginous chia seeds can increase feelings of satiety, the claim of getting full faster does seem accurate – however there are many factors that contribute to feeling hungry; a full stomach is only one and it can be hard to differentiate between low blood sugar and an empty stomach when all you can think about is being hungry. The speed with which you eat is another factor – the seeds need time to become mucilaginous and thus make your stomach feel fuller. The link between chia seeds and fighting belly fat was also a weak one, as the article they cited didn’t even mention chia seeds – rather it stated that abdominal fat can be a precursor for insulin resistance, especially in women. Seeing as the article I linked above stated that NO studies have demonstrated that chia seeds have a direct link to weight loss, I think this claim is tenuous at best, for now at least. Who knows what further research will show? Proteins are macromolecules that consist of chains of amino acids and perform many functions within a human (or any organism), such as enzymatic activity, DNA production and translation and acting as transporter molecules across cell membranes (GLUT-5 fructose transporters are a prime example). Essential amino acids are amino acids that humans cannot synthesise themselves from scratch. Chia seeds contain histidine, isoleucine, leucine, lysine, methionine, phenylalanine, threonine, tryptophan, valine. Non-essential amino acids are amino acids that humans can produce endogenously, except in the case of an illness/genetic predisposition. Chia seeds contain alanine, arginine, aspartic acid, cysteine, glutamic acid, glycine, proline, tyrosine, serine. 55% of the fat content are Omega 3 FA’s. Omega 3 FA’s are essential fatty acids (cannot be synthesised endogenously) and are vital for metabolic processes in humans. Omega 3 FA’s may have a positive effect on systolic blood pressure, can stimulate blood circulation, increases the breakdown of fibrin (involved in clotting) and can reduce blood triglycerides, among other things (evidence here). However, a large intake can also increase LDL’s (so-called “bad” cholesterol) – however the LDL’s become larger and less atherogenic (prone to clotting). One study suggested that the omega 3 FAs in chia seeds help to support cardiac health, however more extensive research is required. Another study suggests that Omega 3 FA’s can have an anti-inflammatory effect on the body, which can reduce the risk of “thrombotic infarction” (blood clot related strokes). It seems that, given the link between omega 3 FA’s and cardiac health, and the high percentage of omega 3 in chia seeds, that this might turn out to be true – just remember that there is a difference between preventing cardiac disease and dealing with it once you already have it. Omega 3 FA’s aren’t a magic pill to fix cardiac disease over night. 18% of the fat content are Omega 6 FA’s, which are present in a favourable ratio to Omega 3 FA’s (less). Omega 6 FA’s convert to Omega 6 eicosanoids (signalling molecules), which play a crucial role in both inflammatory and immune system processes. Some evidence suggests that the overly high ratio of Omega 6:Omega 3 FA’s in a modern Western diet can lead to pro-inflammatory conditions within the body – however, other evidence suggests that it the signalling proteins are acting in response to damage caused by modern exogenous toxins. Either way, it is generally agreed that the current average ratio of 15:1 is much too high, and should be minimised to at least 4:1, or even more optimally 1:1 to 1:4. Calcium is an important mineral for the human body; it supports bone growth and strength, can stimulate stomach acid production, can act as a buffer for other minerals in the blood, can help to control hypertension and plays a part in electrical activity within the body – among other uses (read more here). The average human over 4 years old should consume at least 1000-1300 mg of calcium/day. Chia seeds contain 631 mg of calcium in a 100 g sample, or 179 mg/28 g (ounce). For such a small seed, combined with a healthy diet this will easily allow you to maintain adequate calcium intake. However, there are more traditional ways of getting enough calcium and thus supporting healthy teeth and bones (which isn’t hard), such as a the “glass of milk, piece of cheese and a yoghurt” that was recommended when I was a kid. Pick whichever method works for you. A trace mineral that aids in calcium absorption. Manganese is an essential mineral, and helps to promote good bone density while reducing anaemia and osteoarthritis, among other conditions (read more here). There is no RDI for manganese but the adequate intake (AI) for adult men is 2.3 mg and for adult women is 1.8 mg. Pregnant women require 2.0 mg and breastfeeding women 2.6 mg.
Chia seeds contain 2.72 mg or manganese in a 100 g sample, or 0.772 mg/28 g (ounce). Phosphorous works with the B group vitamins to generate the energy that powers our cells, as well as being essential for bones and teeth, muscle contractions, nerve conduction and kidney health (read more here). The RDI for a healthy adult is 700 mg/day, and you should not exceed 4000 mg/day (this reduces to 3000 mg/day after age 70, due to the increased chance of kidney malfunction). 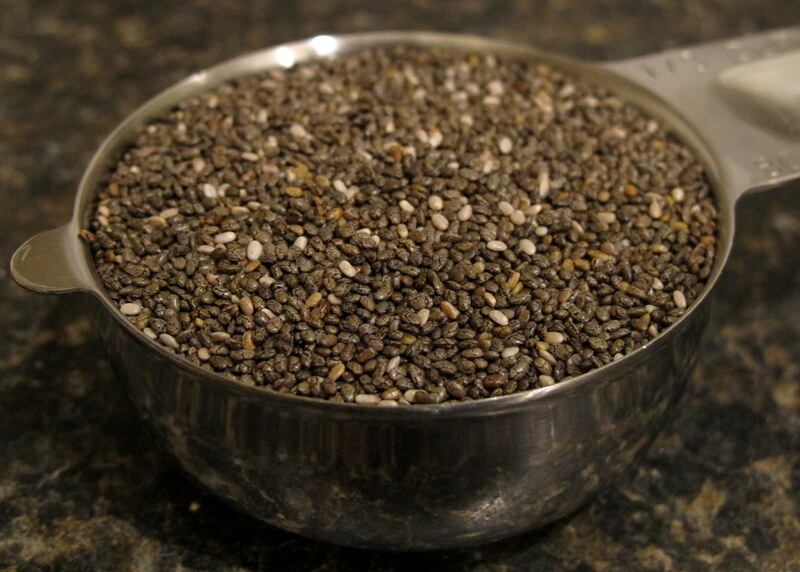 Chia seeds contain 860 mg of phosphorous in a 100 g sample, or 244 mg/28 g (ounce). B group vitamins are water soluble and play an important role in cellular energy production along with phosphorous, as well as preventing anaemia (read more here). The B group vitamins in chia seeds include B-1 (thiamin), B-2 (riboflavin), B-3 (niacin), folate and B-12. Antioxidants do just what their name suggests – they prevent oxidation of molecules within the body. Oxidation reactions can produce free radicals (unpaired valence electron for those who are interested), which in turn makes the molecule more likely to want to react with something else, as electrons like to be in pairs and an atom is happiest when its outer shell is full. When oxidation reactions occur within cells, they can damage it or even cause cell death – thus it is good to have an adequate intake of antioxidants to maintain cell health. Cholesterol is a member of the sterol family and is essential to bodily structures and functions such as cell membranes and steroid compounds, as well as being an atherosclerotic compound. It is either synthesised endogenously or obtained in our diet (read more here). High density lipoproteins (HDL) or the so-called “good” cholesterol carries cholesterol away from the arteries and back to liver, where it is eliminated from the body. Low density lipoproteins (LDL) or the “bad” cholesterol carries cholesterol throughout the circulatory system – when too much is present, it can begin to build up along the lumens of blood vessels and form a plaque, along with some other compounds. This plaque hardens and narrows blood vessels, increasing the risk of cardiac disease, myocardial infarction and stroke. There is so much contention surrounding cholesterol/hypercholesterolaemia and its management at the moment. There’s either the low fat/cholesterol intake approach (read more here) or the saturated fats are good/eat low carb approach (read more here and here). This is not the time to discuss the merits of either of those methods but if cholesterol in food worries you, you will be happy to know that chia seeds do not contain much. They contain no sugars and 42.12 g/100 g carbohydrates by difference. Subtracting the 34.4 g/100 g of fibre, this leaves us with 7.72 g of carbohydrates other than fibre in a 100 g sample. FODMAPs – low carb hints at this but obviously low FODMAP is good for the fructose malabsorbers out there. Patsy Catsos, of IBS – Free at Last fame, recommends them as a good source of fibre, with a serving size of no more than 2 tbsp. chia seeds per meal. Sodium (Na) is an essential nutrient that plays a role in many bodily functions, including electrical activity, metabolic processes, acid-base balance and maintaining blood plasma volume (read more here). Too much sodium can lead to hypertension and an increased risk of cardiac disease and stroke. The minimum requirement for sodium is 200-500 mg/day. The RDI for sodium is a maximum of 2400 mg/day. Chia seeds contain 16 mg of sodium in a 100 g sample, or 5 mg/28 g (ounce) – in other words, they are very low sodium. Chia seeds are a good source of fibre, even for those with FM, as there is no inulin or other FODMAP fibres present. A low fibre diet, which some FMers can fall into the trap of following, can lead to unformed stools, as there is nothing there to bind the waste together – Patsy Catsos recommends ground chia seeds as a good source of fibre to combat this. For some with IBS as a separate issue to FM, the high fibre in chia seeds can cause problems – gurgly stomachs, stomach and gut cramps and constipation or diarrhoea to name a few. It’s the typical FM case of you need to try it yourself and see – which isn’t really an answer but it’s just something that we need to accept as part of our life. Fructose malabsorption is not as cut and dry as Coeliacs disease. Chia seed puddings – perfect for a breakfast or snack on the go. Salads – replace the sesame seeds in this strawberry salad, or any salad. Add them to homemade muesli bars. Grind them and use them as a xanthan gum substitute in baking – I have not tried this personally. Throw them into your breakfast muffins. All in all, chia seeds are a great addition to your diet if you can tolerate them. They are packed full of many important nutrients, which in a reasonable serving size would help to maintain health. Just don’t expect to eat chia seeds for one week and see the weight fall off/heart disease disappear and osteoarthritis improve if you aren’t also following a healthy eating and exercise plan – and even then it will take much longer than that. There is no such thing as a magic pill to fix all these problems and while chia seeds certainly contain the right components, they are by no means going to fix these issues if you aren’t using them in combination with a healthy lifestyle.